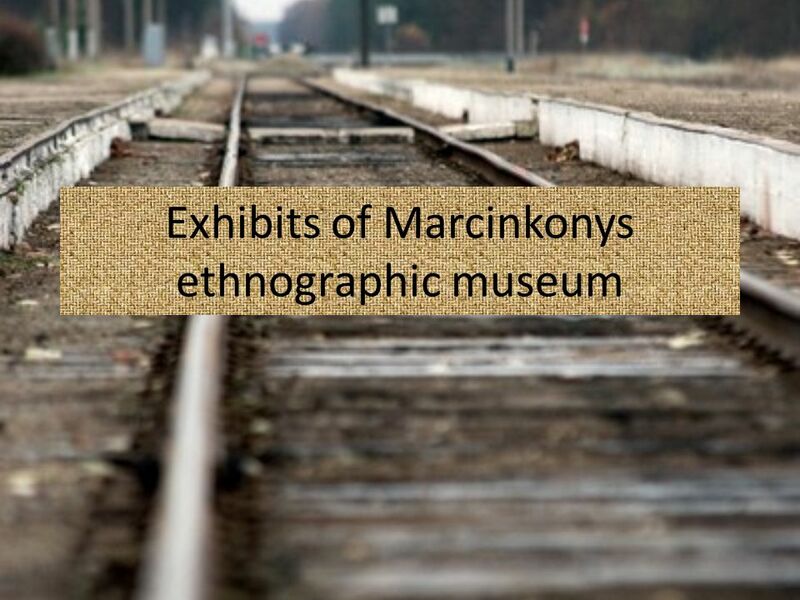 4 About the village Marcinkonys is a village in Varėna district, Lithuania, located to the south-east of Merkinė. 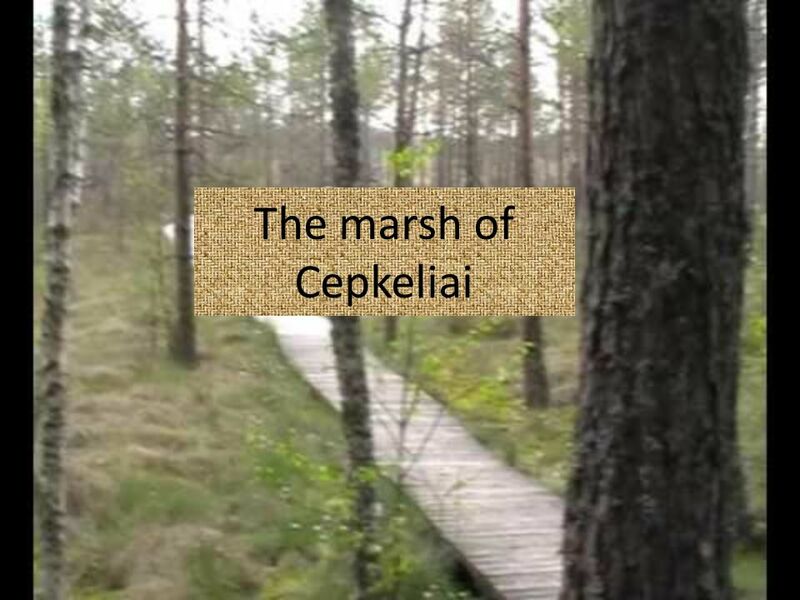 It is the administrative center of the Dzūkija National Park and Čepkeliai Marsh. According to the 2001 census, it had 765 residents. The settlement has been known since 1637, when it was a camp of foresters. 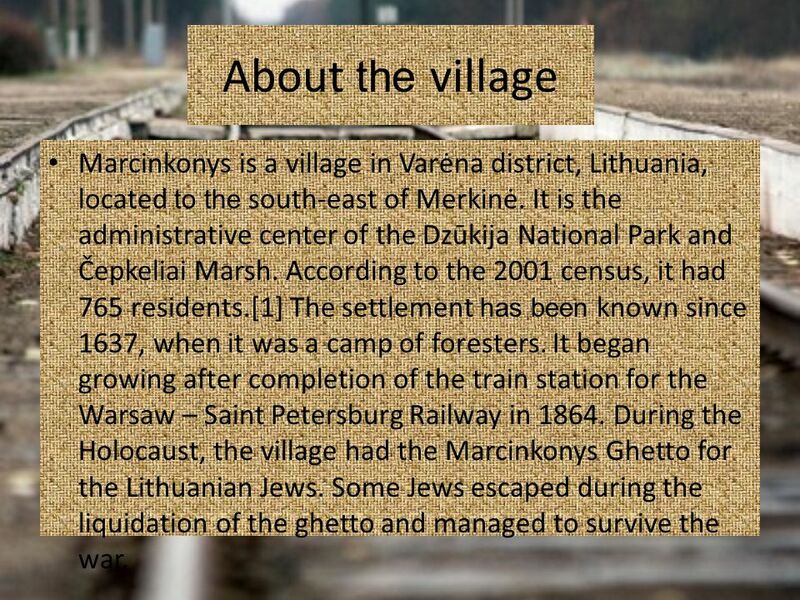 It began growing after completion of the train station for the Warsaw – Saint Petersburg Railway in During the Holocaust, the village had the Marcinkonys Ghetto for the Lithuanian Jews. Some Jews escaped during the liquidation of the ghetto and managed to survive the war. 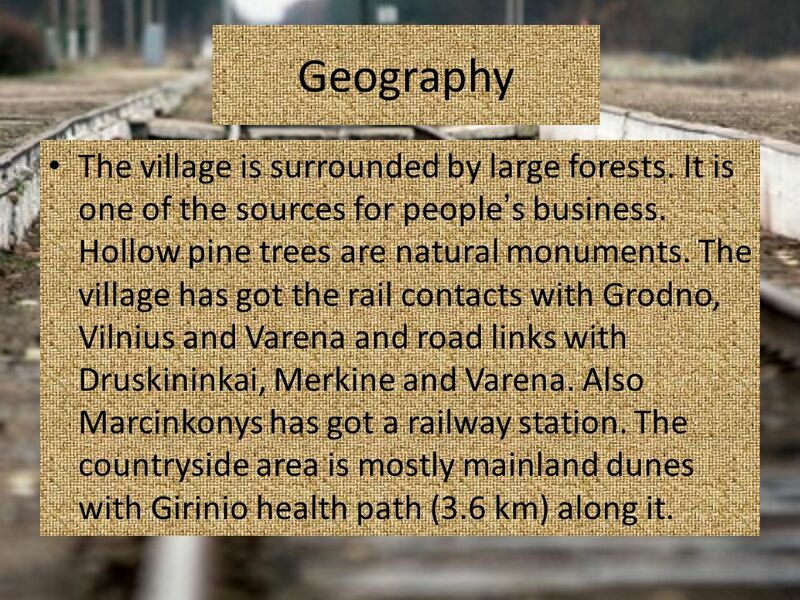 5 Geography The village is surrounded by large forests. It is one of the sources for people’s business. Hollow pine trees are natural monuments. The village has got the rail contacts with Grodno, Vilnius and Varena and road links with Druskininkai, Merkine and Varena. 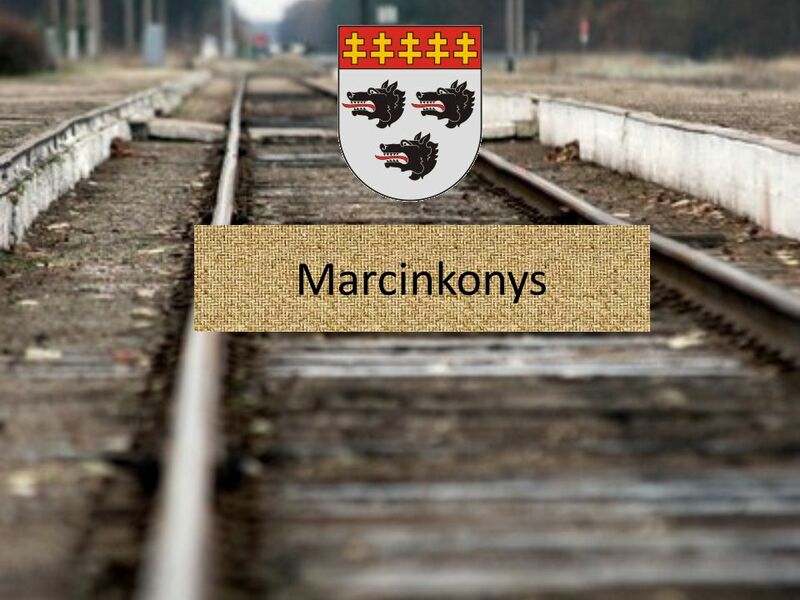 Also Marcinkonys has got a railway station. The countryside area is mostly mainland dunes with Girinio health path (3.6 km) along it. 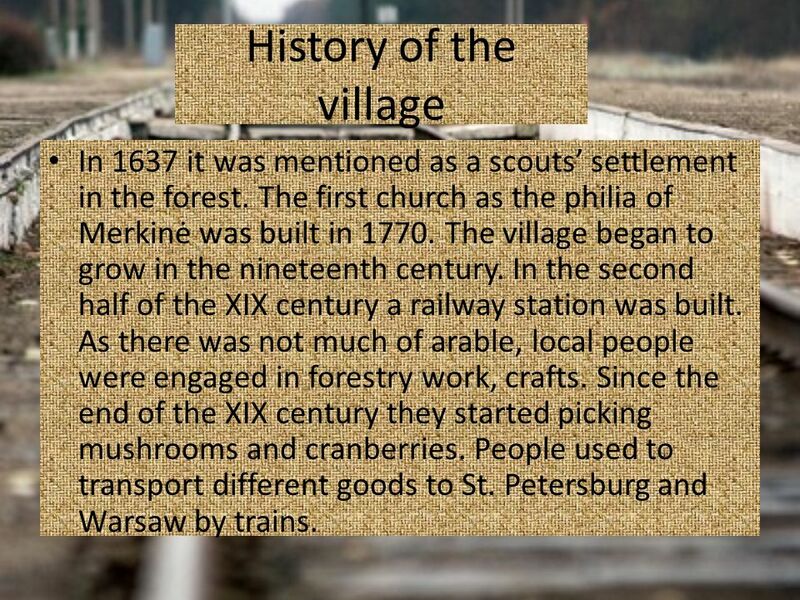 7 History of the village In 1637 it was mentioned as a scouts’ settlement in the forest. 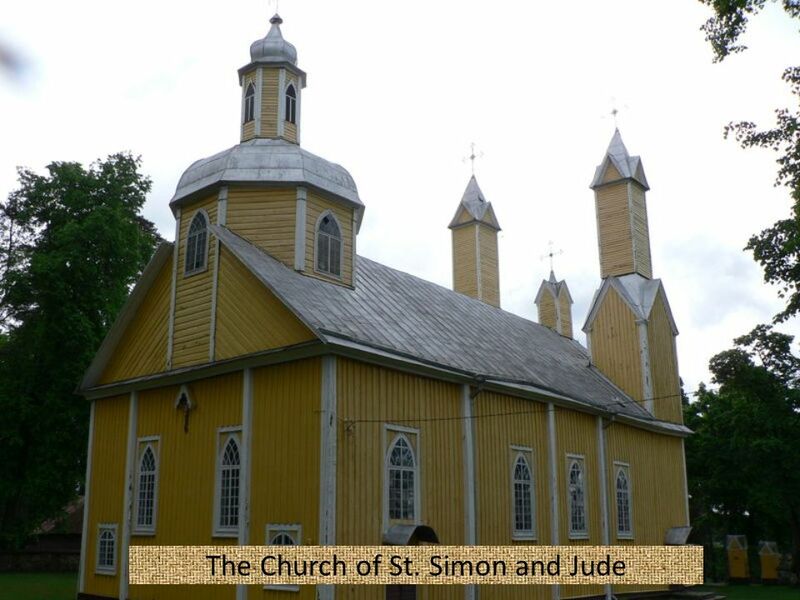 The first church as the philia of Merkinė was built in The village began to grow in the nineteenth century. 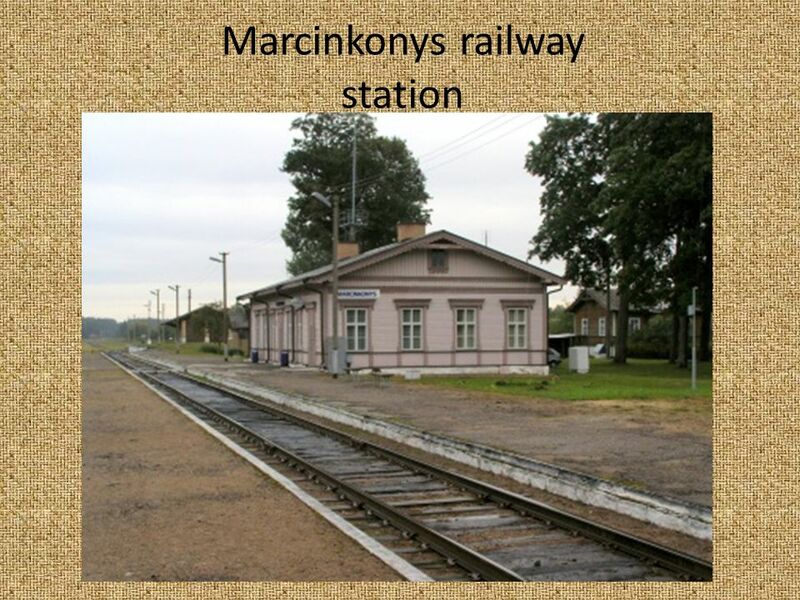 In the second half of the XIX century a railway station was built. As there was not much of arable, local people were engaged in forestry work, crafts. Since the end of the XIX century they started picking mushrooms and cranberries. People used to transport different goods to St. Petersburg and Warsaw by trains. 1. 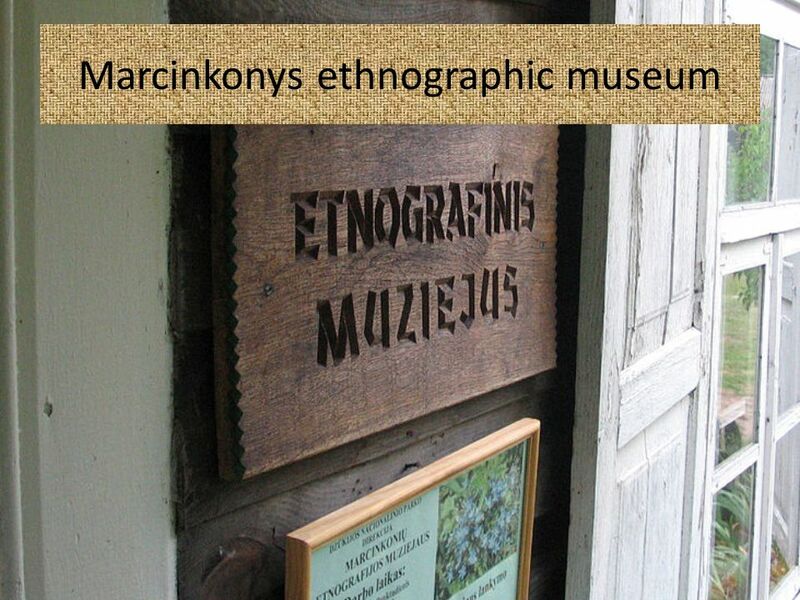 The ethnographic museum established in 1994 m. 2. The Čepkeliai State Reserve Museum of Nature established in 1996 m. 3. The Cemetery of victims of hitlerism. 4. 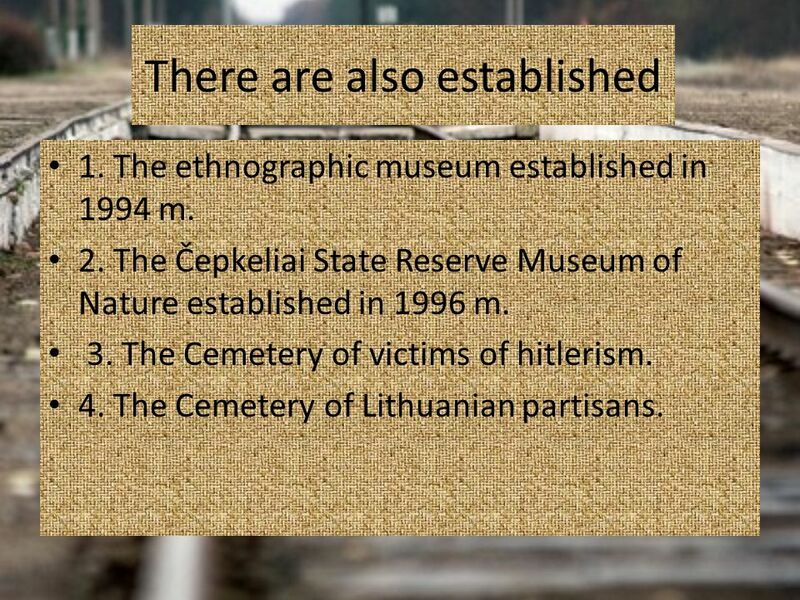 The Cemetery of Lithuanian partisans. 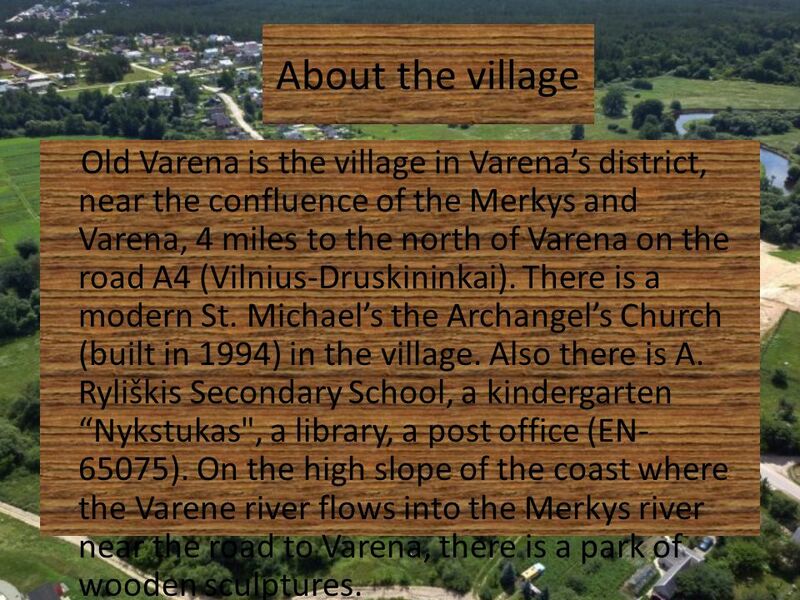 21 About the village Old Varena is the village in Varena’s district, near the confluence of the Merkys and Varena, 4 miles to the north of Varena on the road A4 (Vilnius-Druskininkai). There is a modern St. Michael’s the Archangel’s Church (built in 1994) in the village. Also there is A. Ryliškis Secondary School, a kindergarten “Nykstukas", a library, a post office (EN-65075). On the high slope of the coast where the Varene river flows into the Merkys river near the road to Varena, there is a park of wooden sculptures. 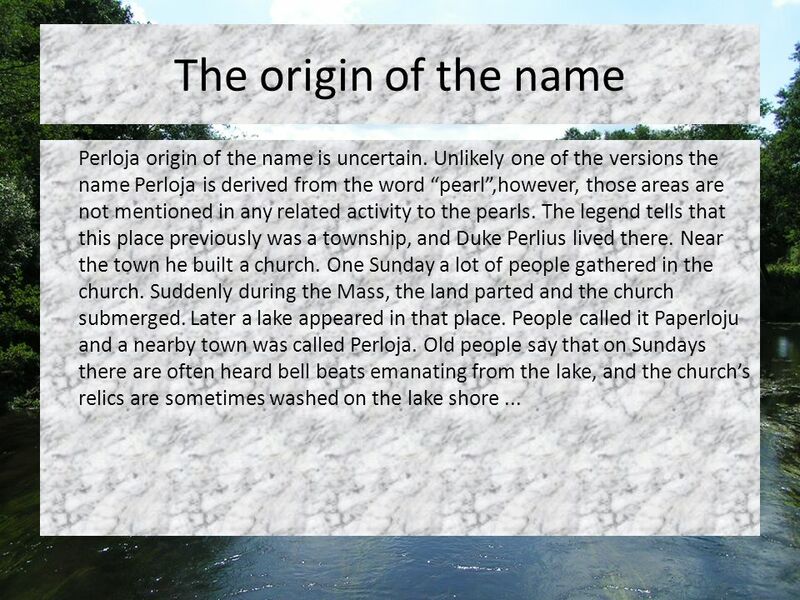 22 The origin of the name The origin of the settlement’s name comes from the river Varene ( previously known as the Varena) which flows through the town. Concerning false overwrites in the Polish language the name remained without the first letter (Orany). The legend tells that the name is derived from name of the goddess Varene, who used to patronize hunters and fishermen near the river. The others derive the name of Varena from the word “varyti“( in Lithuanian), which means to drive wild beasts during the hunting. This option is the most likely as it describes best the actual living conditions of that time. 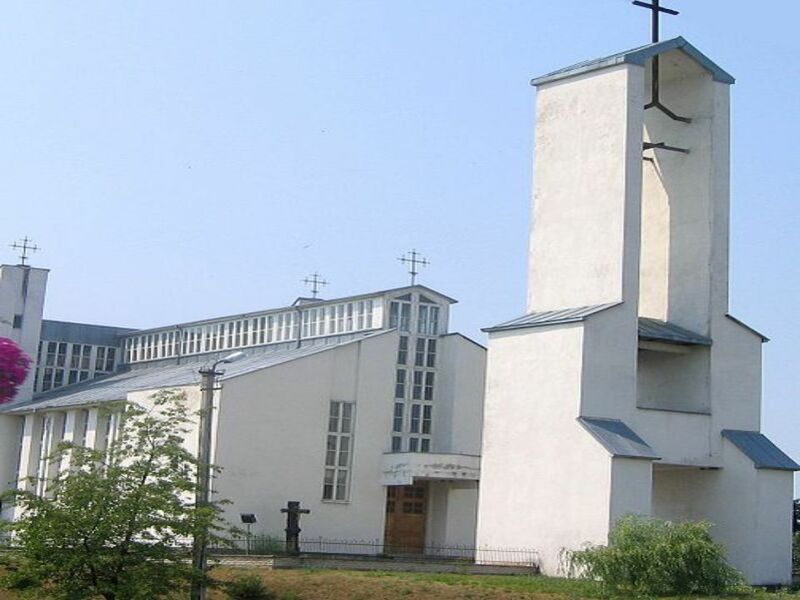 In 1990 the architects Brunonas Bakaitis and Gediminas Baravykas made the old church’s project in Old Varena. 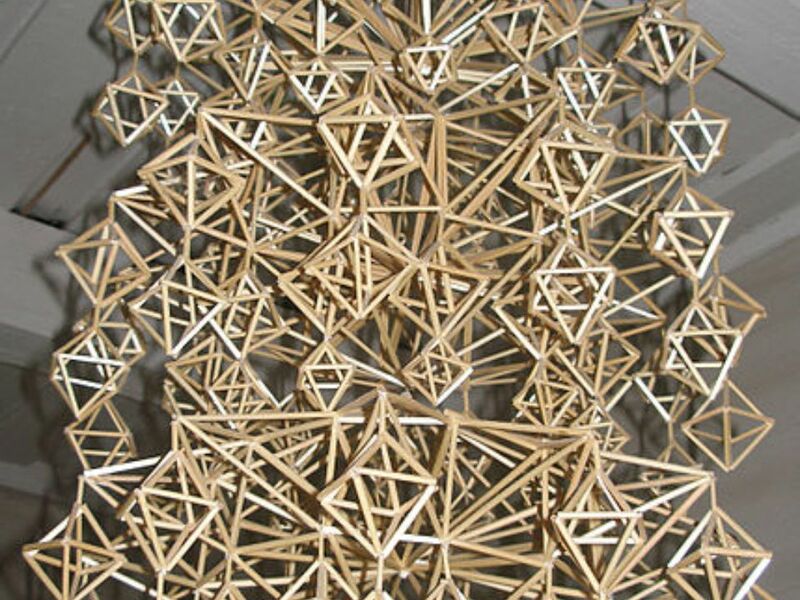 They used various forms and shapes which are close to Čiurlionis art. 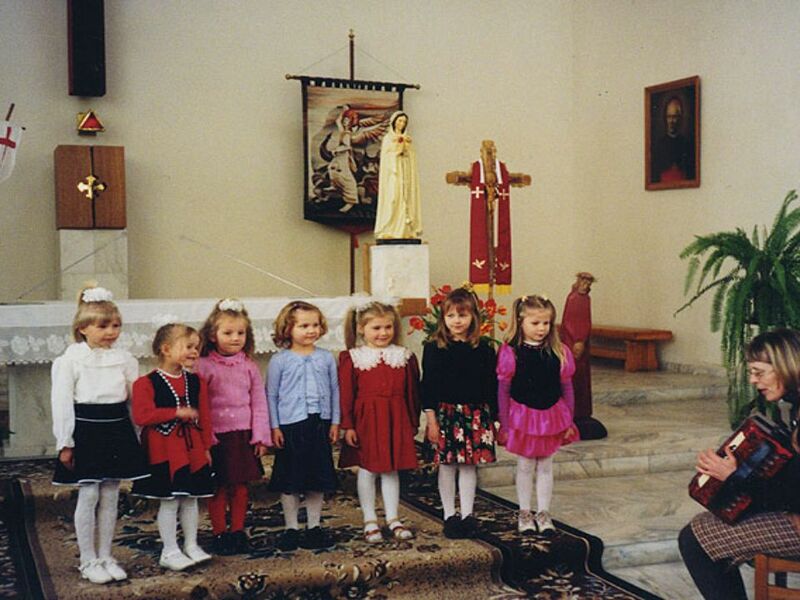 The church was built and consecrated in 1994. 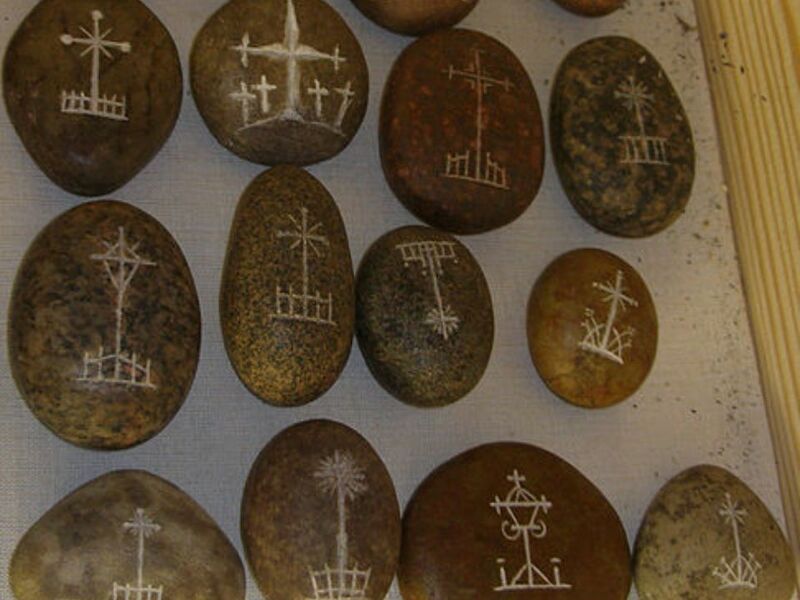 26 History of Old Varena The first time Varena was mentioned in historical sources in 1413 , the 13th January. 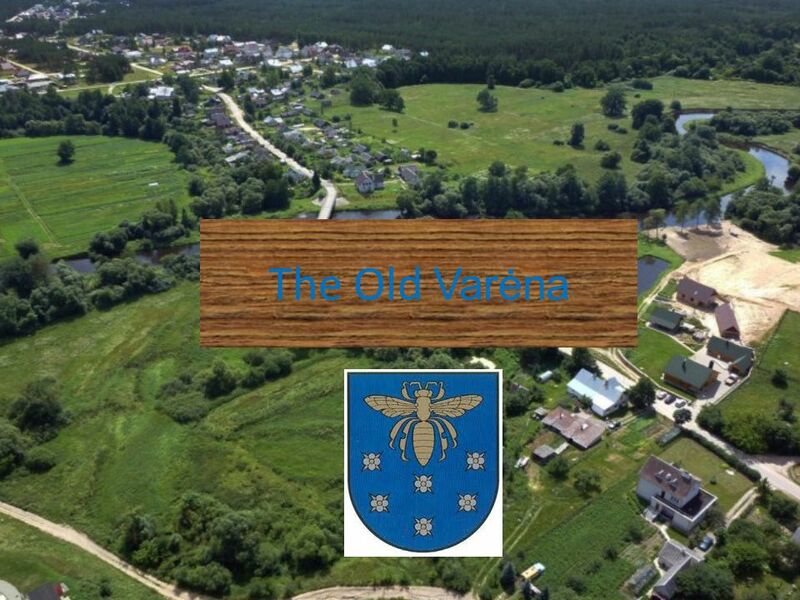 The Master of the Order in his letter states that he started "a new hunting estate, known as Varena, along the river Merkys”. Later there was built a mansion, which belonged to Grand Treasurer M. Bžostovskis. This new settlement was first mentioned in In the sixteenth century it was mentioned as a royal mansion of Varena. The town started vanishing in the XVII century and in the middle of the XVIII century when wars started. At the end of the XVIII century there was a parish school. 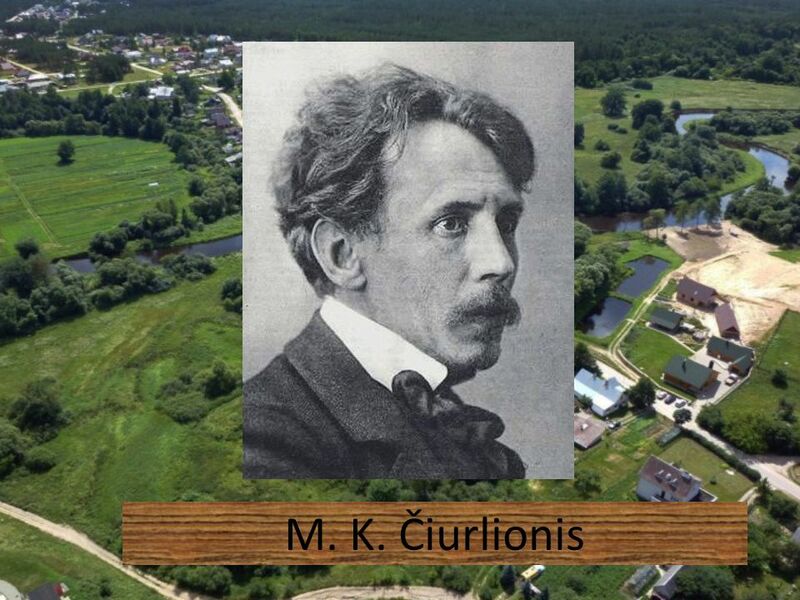 27 The most famous people A famous composer and painter M. K. Čiurlionis ( ) was born in Old Varena. Now there is just a stone indicating the place of the house where he used to live . An oak roofed poles "alley" built on both sides of the road, known as Čiurlionis Way, stretches from this place until Druskininkai city. 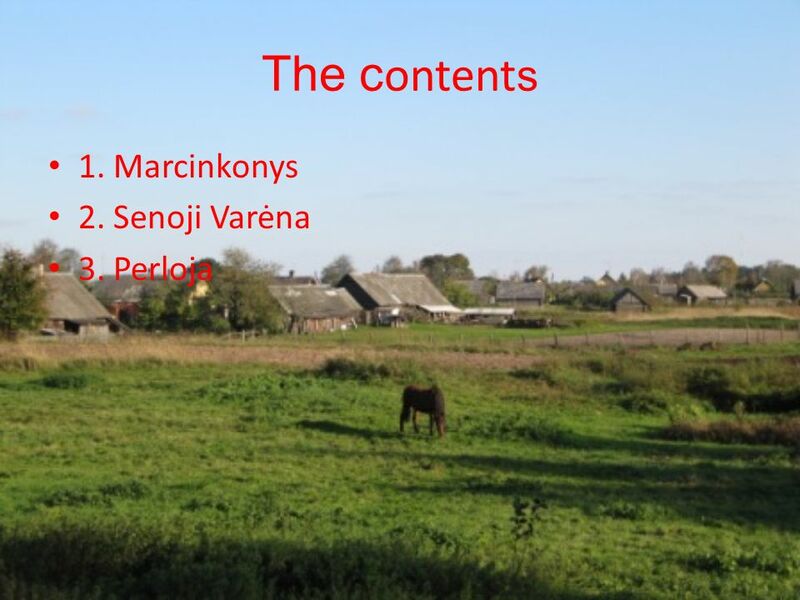 30 About the village Perloja is a village in Varėna’s district, Lithuania. 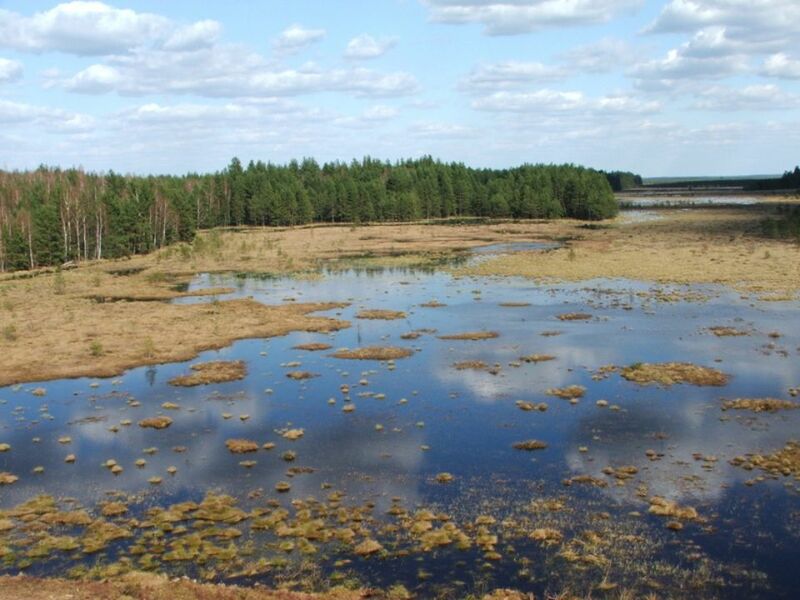 It is situated 19 km (12 mi) to the west from Varėna on the banks of the Merkys River and on the Vilnius–Druskininkai road. 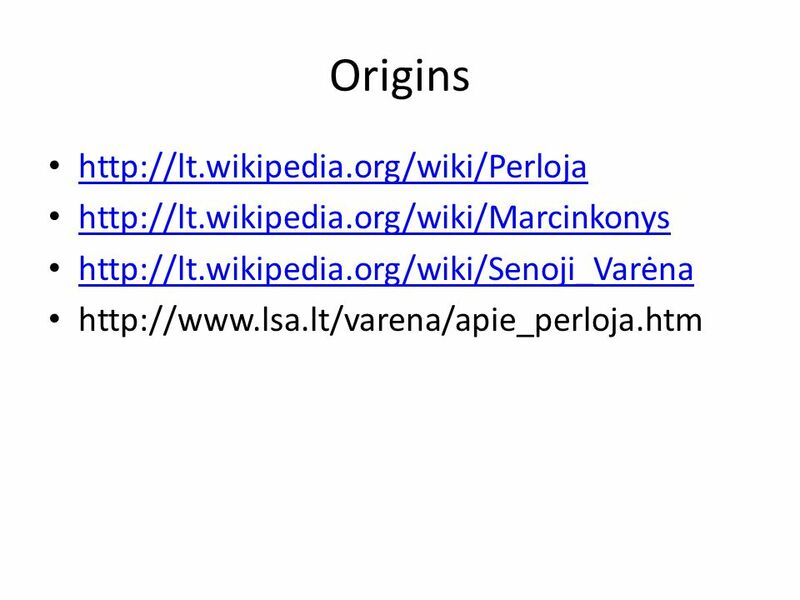 The village is known for the so-called Republic of Perloja, an independent micronational republic was established in the aftermath of World War I and existed until According to the 2001 census, it had 774 inhabitants. 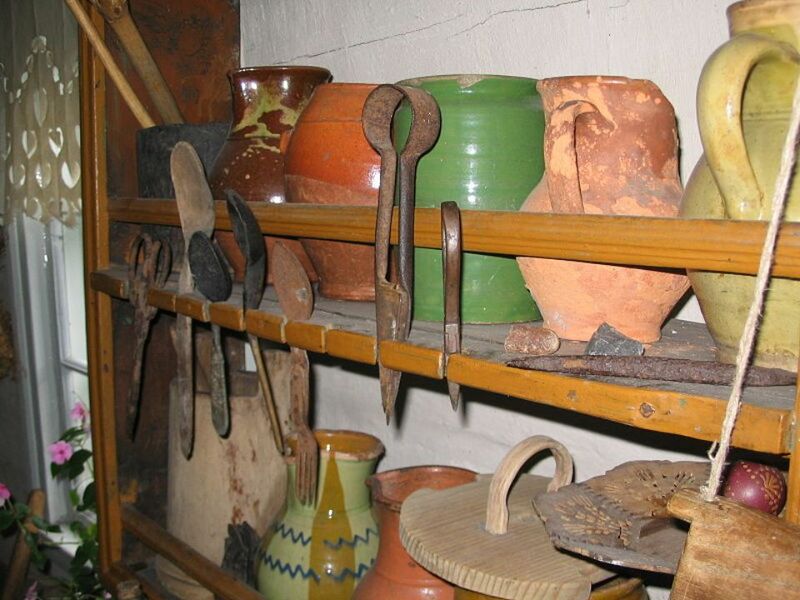 33 History of the village Archaeological research dates human presence in the area to the Neolithic era. 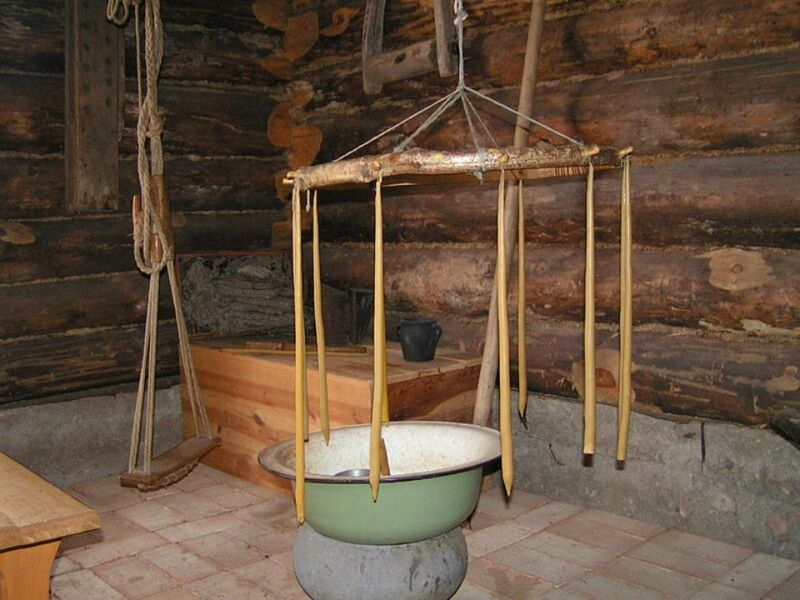 Perloja village was first mentioned in writing in Situated on the important Vilnius–Hrodna road, the village had a royal estate for accommodation of travelling Grand Dukes and other Lithuanian nobles. 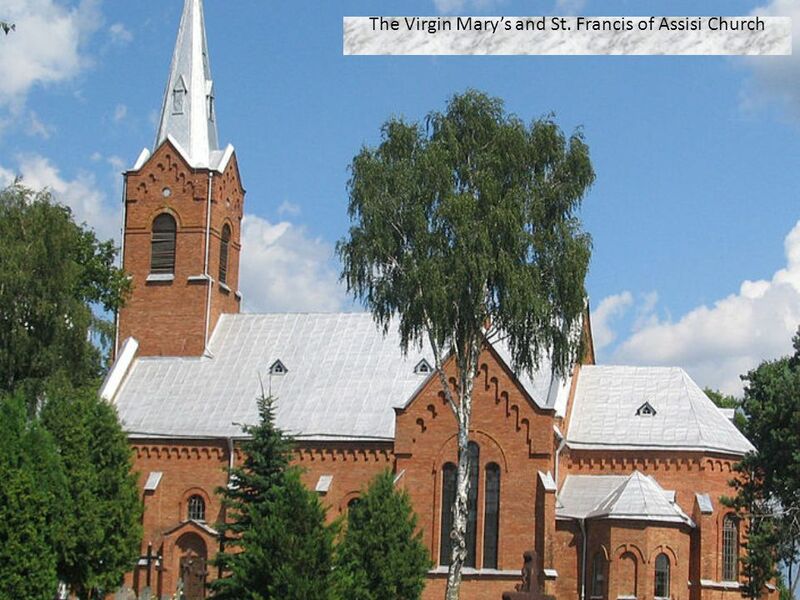 After Christianization of Lithuania, the village was one of the first places to construct a Catholic church funded by Vytautas the Great. In 1710, during the Great Northern War, the plague wiped out almost all inhabitants of Perloja. However, the settlement recovered and was granted the Magdeburg rights and coat of arms in The arms depicted a bull with Latin cross on its head. 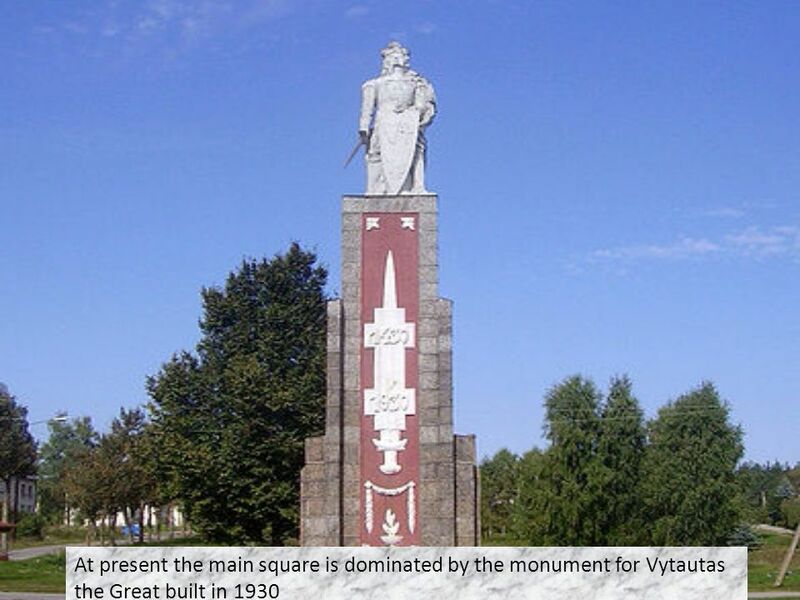 Possibly the image was borrowed from Kaunas. The arms and the rights were soon abolished as the village was absorbed into the Russian Empire following the partitions of the Polish–Lithuanian Commonwealth. The historic coat of arms was restored in 1993. 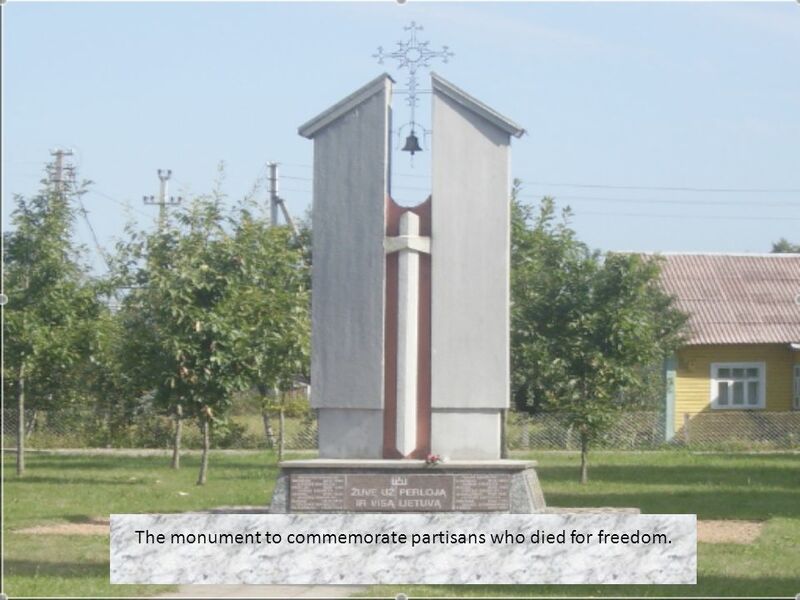 36 The monument to commemorate partisans who died for freedom. 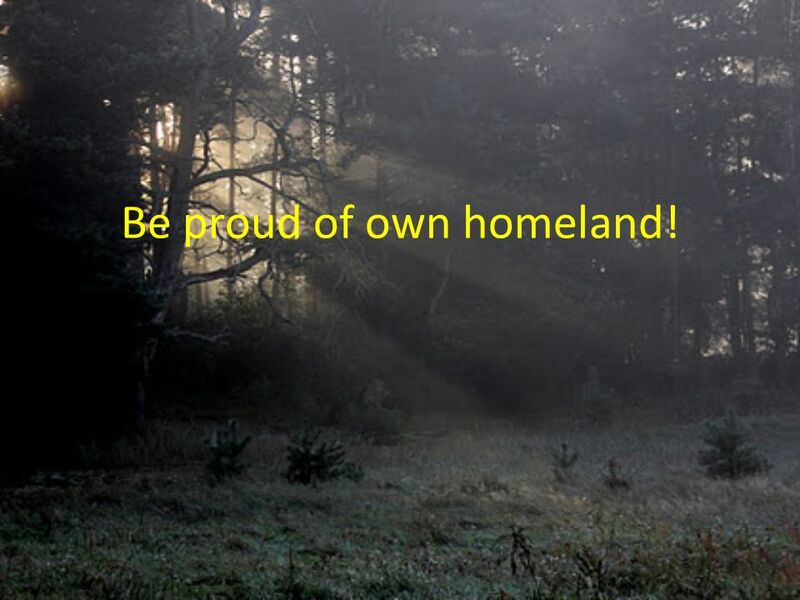 37 Be proud of own homeland! 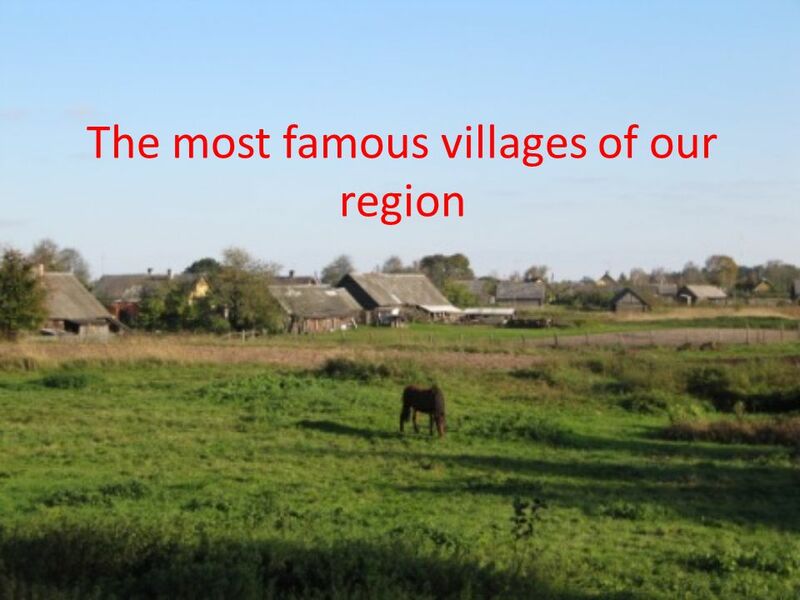 Download ppt "The most famous villages of our region"
THE JACEK ODROWĄŻ LOWER SECONDARY SCHOOL in LASOWICE WIELKIE. Made by: Domicelė, Aurėja, Aivara, Eimantas, Justinas, Aistė, Lina and Lukas. 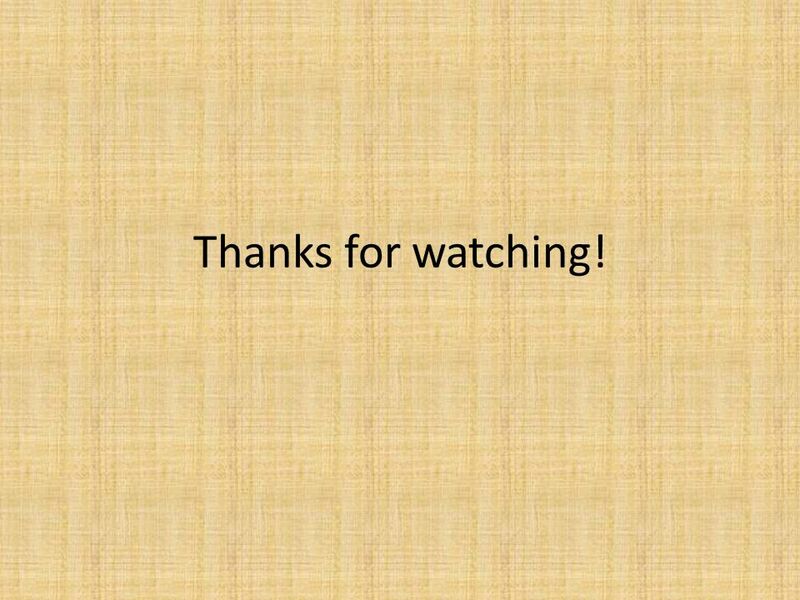 Free Powerpoint Templates Page 1 LITHUANIA by Rita Adomonienė. Sereď My town Barbora Marková. Sereď is a city located in Trnava. 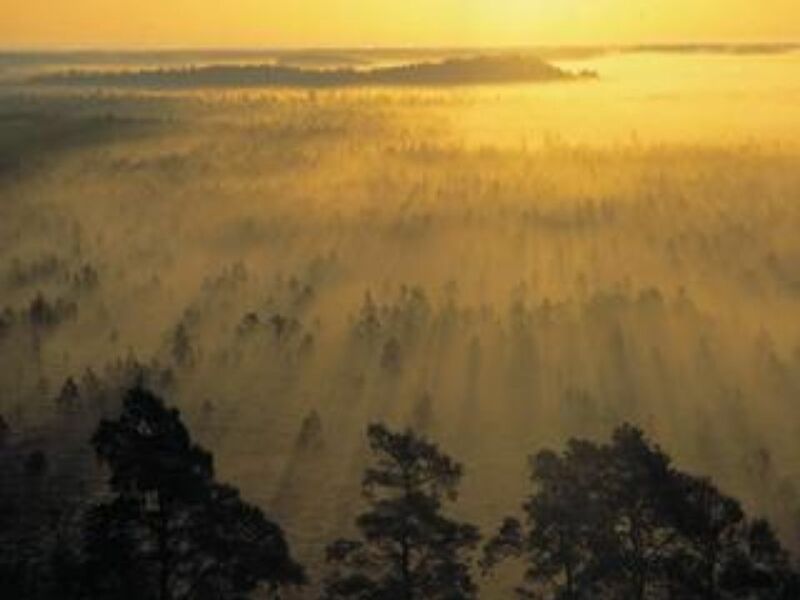 It has an area of ​​ km ² and lived here almost inhabitants. Sereď is rich. 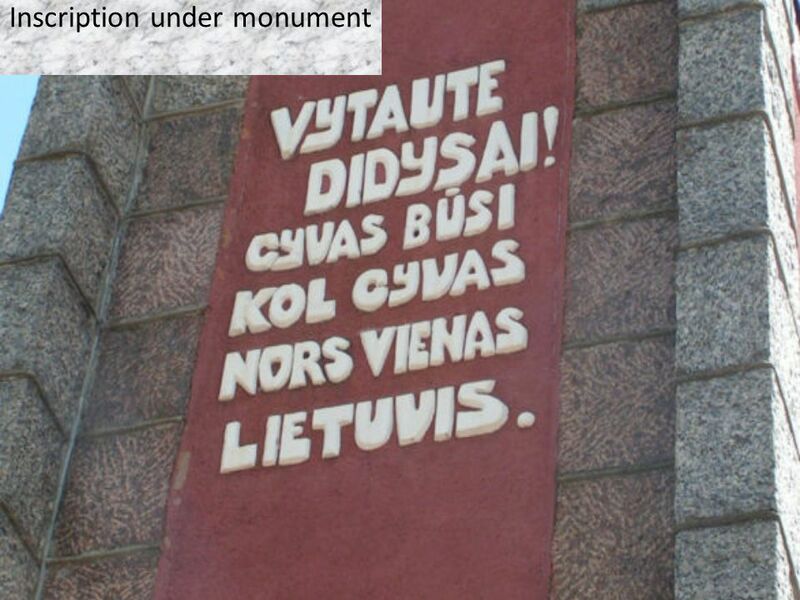 The International Commission for the Evaluation of the Crimes of the Nazi and Soviet Occupation Regimes in Lithuania Ingrida Vilkiene Deputy director and. Slovenia The Republic of Slovenia lies at the heart of Europe where the Alps and the Mediterranean meet the Pannonian plains and the mysterious Karst. Welcome to our town Bielsk Podlaski POLAND. Come with us and walk around.  Is the capital and largest of the Czech Republic. It is the fourteenth-largest city in the European union. 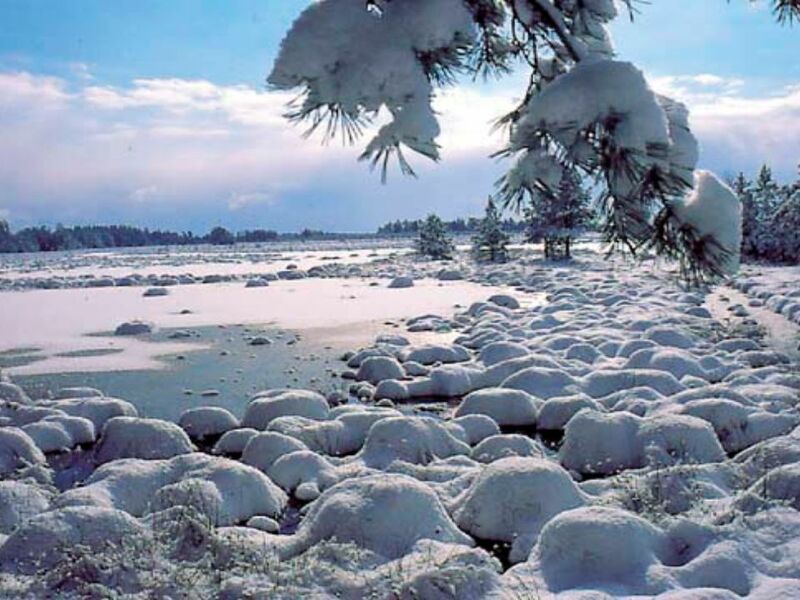  Situated in the north-west of the country. Kaliningrad is a seaport and the administrative center of Kaliningrad Oblast, the Russian exclave between Poland and Lithuania on the Baltic Sea. The. Towns of our region. Pelhrimov Pelhrimov is the district town of the Pelhrimov district. There is our school, the Business Academy. London is the largest urban area and capital of England and the United Kingdom. At its core, the ancient City of London, to which the name historically. The Moscow Kremlin - the oldest part of Moscow, the main socio-political, spiritual, religious, historical and artistic complex of the capital, the. Lithuania. Lithuania, officially the Republic of Lithuania is a country in Northern Europe, the southernmost of the three Baltic states. Situated along. Zdeno Uher, Siby Ivanicsová, Carmen Ondróová and Nicolas Križán. REGION AND TOWN KRAJENKA. Administrative division of Poland KRAJENKA REGION. The Greatest City of the RF MOSCOW Выполнила: учитель английского языка ГБОУ СОШ № 771 ШАШЛОВА Е.В.